The inaugural, UK ‘Local Bike Shop Day’ took place on Saturday 6 October 2018. This celebratory day was inspired by the success of UK Record Store Day which is now in its 13th year. 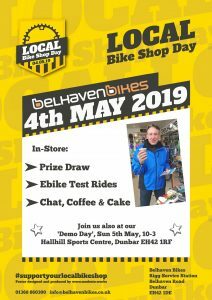 This year ‘Local Bike Shop Day’ takes place Saturday 4 May 2019 and continues to give smaller, independent stores an opportunity to highlight what sets them apart from the bigger national retailers, namely being at the centre of their communities, specialist knowledge, personal service, individuality, and their dedication to help cyclists get the most out of their cycling, whether they use their bike for leisure, commuting or competing. Drop in to see us on Saturday 4 May for a chat about all things bike. 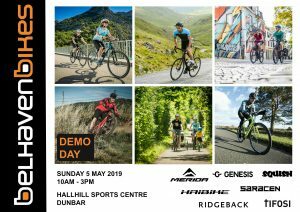 And if you fancy a total weekend of cycling celebrations, drop by our ‘Demo Day’ the next day at Hallhill Sports Centre, Dunbar. Check out our News item for all the details.